The first mobile phone call was made 40 years ago, on 3 April 1973. Marty Cooper, a senior engineer at Motorola, called a rival colleague at another telecoms company and announced he was speaking from “a ‘real’ cellular telephone”. In 2012 a report carried out by the International Telecommunication Union found that there were six billion mobile phone subscriptions worldwide. At the time the global population was seven billion. “In 40 years we’ve moved rapidly from the mobile phone as a businessman’s tool, through consumerisation and internet access to everything being connected,” Dr Mike Short CBE, former president of the Institute of Engineering and Technology and Vice President of Telefonica Europe, told the BBC. “In the future we will see a much wider range of devices – many of which will be wearable,” he added. “We will work more fully with all the senses. The move to glasses has begun – how can we use eye control to change and look at pages? “Wearables, in terms of (smartphone) watches, are coming. We’ll also see health measurement body vests that can communicate with your phone and then your doctor,” said Dr Short. Martin Cooper, now aged 85, is renowned as the “father” of the mobile phone. 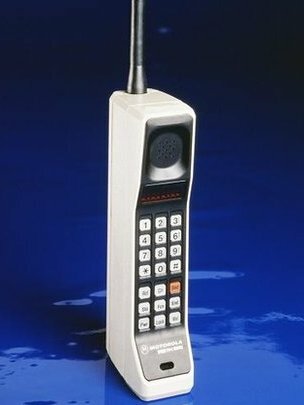 In a previous interview with the BBC he admitted he thought the initial cost of the devices (in 1983 the first models cost $3,500, or £2,300) might be prohibitive to the mobile phone becoming a mass-market product, but he did recognise that the hefty handsets would probably shrink. “We did envision that some day the phone would be so small that you could hang it on your ear or even have it embedded under your skin,” he said. Mr Cooper said his vision for a mobile phone was first conceived in the late 1960s when the car telephone was invented by AT&T. He wanted to create “something that would represent an individual so you could assign a number not to a place, not to a desk, not to a home but to a person,” he said. “It pleases me no end to have had some small impact on people’s lives because these phones do make people’s lives better. They promote productivity, they make people more comfortable, they make them feel safe and all of those things,” Mr Cooper added. He was also pleased to have been one step ahead of the competition. “When you are a competitive entity like we were, it’s one of the great satisfactions in life,” he said.